LOOK WHAT’S COMING IN EARLY JUNE! What if everything you’ve been telling yourself about being caring, successful and productive contributes to your unhappiness and self-defeating habits? What if these very qualities that you view as virtuous and necessary to succeed in the world are keeping you disconnected from yourself and sabotaging your life? Dennis Portnoy provides practical and effective solutions to a problem many people face: neglecting one’s inner self in order to "fit in” with external demands, real or perceived. 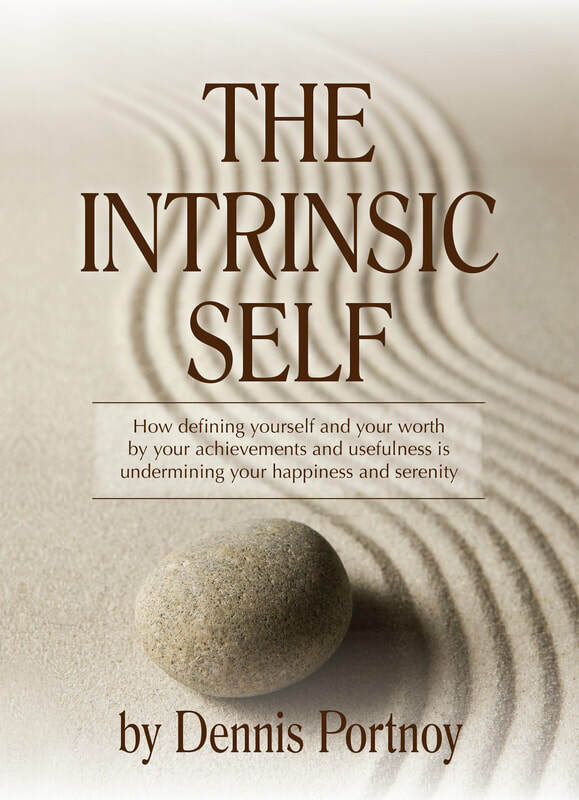 THE INTRINSIC SELF presents down-to-earth wisdom to form a practical, personally transformative guide that provides concise and accessible ways to transform lives that are outwardly focused into lives based on one’s core values. "This book will help men and women who are caught in the cultural norm of defining success through our achievements. I believe it will be particularly helpful to men. Too many men blame themselves when they aren't able to live up to the standards of success that are demanded by our money-driven society. Portnoy's book offers a sensible and compelling way to be successful in today's world." Jed Diamond, Ph.D, 12 Rules for Becoming Your Own Man: Your Guide for Living Fully, Loving Deeply, and Making a Difference in the World (forthcoming, Fall, 2019). What I’ve seen again and again in my thirty-plus years as a psychotherapist, and seminar leader, is that being too externally focused often lies at the heart of our stress and emotional struggles. Many of us have achieved the things that society deems successful, yet feel unfulfilled and anxious because we define ourselves, and our worth, according to what we do, rather than who we are. We equate our self-worth with accomplishments, conforming to societal norms, peer acceptance and family expectations. When we are estranged from our Intrinsic Self, we overlook our own needs, and instead attend to the needs of others, often accommodating them to "fit in" and maintain harmony. Our need for external validation and the feeling that we are never "enough" creates stress and keeps us stuck in repeated self-destructive patterns. The Intrinsic Self can help you break free from the external trap by teaching you to challenge outdated survival strategies that create a need to see yourself, and be seen by others, as competent or helpful in order to feel adequate and emotionally secure. Much more than simply increasing self-esteem, you will learn how addressing the specific ways you define your value and identity is key to creating a richer, more fulfilling life.